Don't miss Tous Les Jours Anniversary Promo happening on November 11, 2017 from 11am to 1pm! 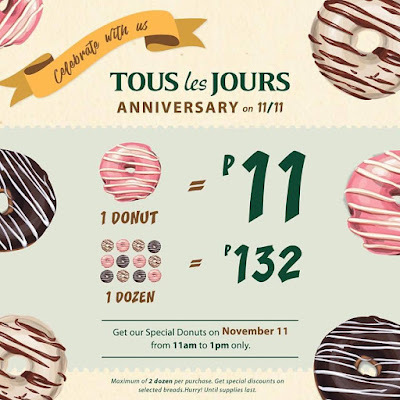 Get their Special Donuts at P11 only per piece**! Get special discounts also on Tous Les Jours Macarons and selected breads! **maximum of 2 dozens only per purchase. Get your donuts from 11am to 1pm only!